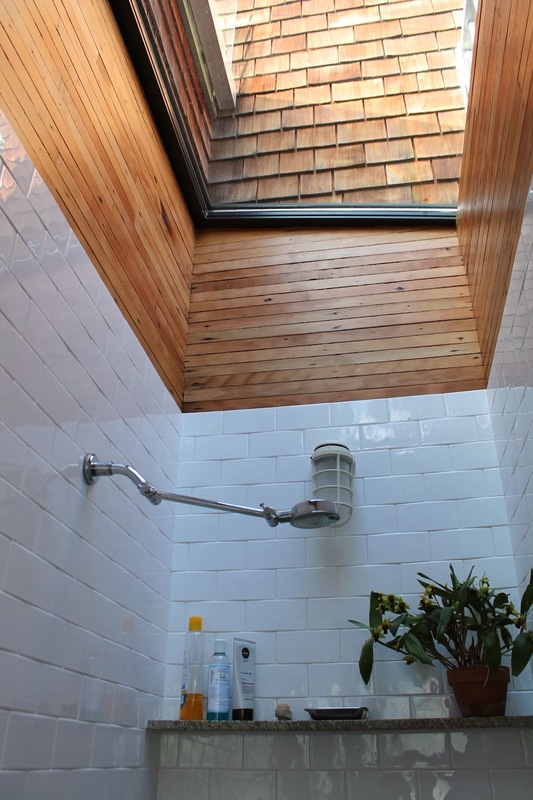 I am finally *finished with the lath paneling in the master bath shower. If you recall it started out looking like this and this project is part of my overhaul of the master bath. *This part of the project is 95% finished. 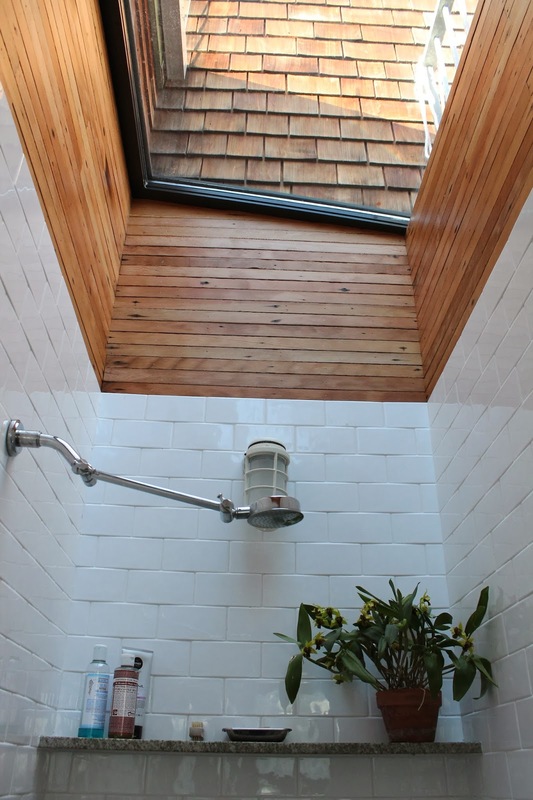 I still need to add a tiny strip of trim at the very top where the lath meets the skylight. For the best match, the trim needs to be douglas fir and I need to make a special trip to DBS here in the city to get that. 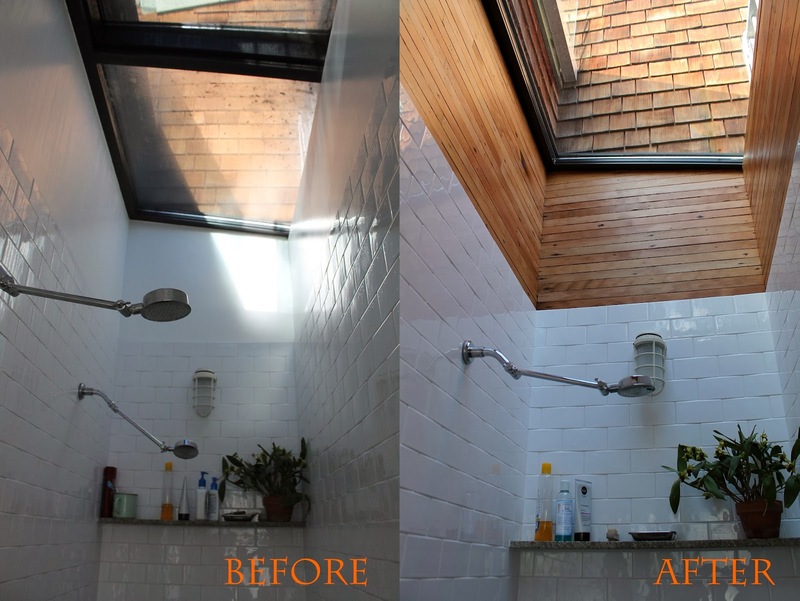 I also need to re-caulk the skylight on the deck edge. 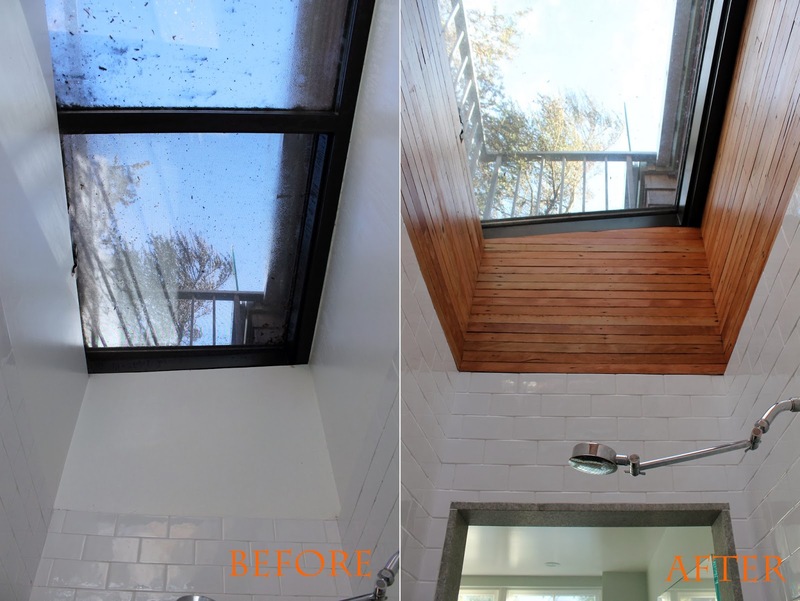 I have not had any leaking, but I noticed while I was up on the ladder that there are some gaps in the caulking where the skylight attaches to the deck. I finally have the answer to why I have so many ants in my bathroom -they are living in the large pots I have on the deck and are dashing inside to get out of the cold in the convenient little gaps in the caulk! I really like the way the lath looks like a continuation of the shingles from the exterior of the house. 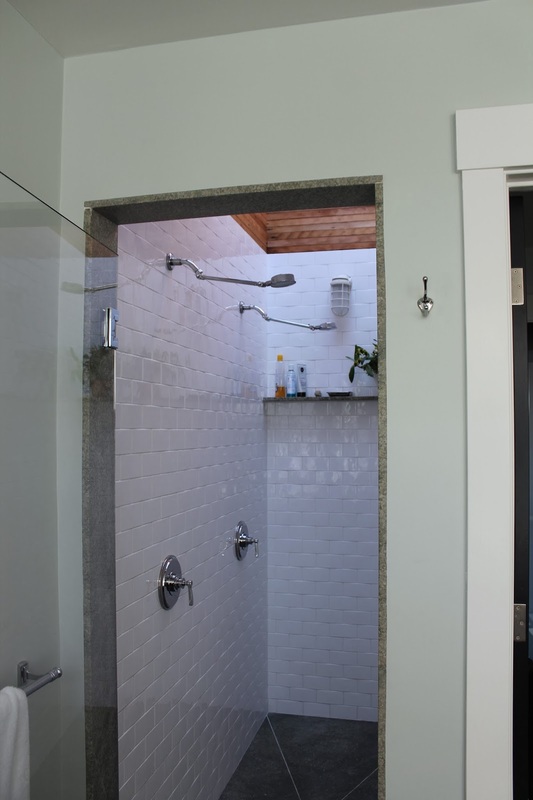 The lath also significantly warms up the feel of this shower. The white drywall that was up there before looks really cold and unfinished in hindsight. It is remarkable how nice plain old lath looks when it is planed down. You can see how I did that here. The trickiest part of this project were the pieces at the top that needed to be cut at an angle, which I did by hand with a dovetail saw. It's pretty simple, establish the angle, mark the line with a pencil and follow with the saw which is very stiff and holds the line perfectly. I would have preferred to leave the wood raw because I like it matte but really did't want to risk the possibility of mildew growing in the wood (it gets black specks). I sealed it with 3 coats of this water based polyurethane, which wasn't too shiny after all. I also used stainless steel brads so that I don't get any discoloration and bleeding from the nails into the wood. You can see the process I used here to install the lath. I had my doubts about this project when I started but I do feel that the lath looks like it was part of the original design plan. 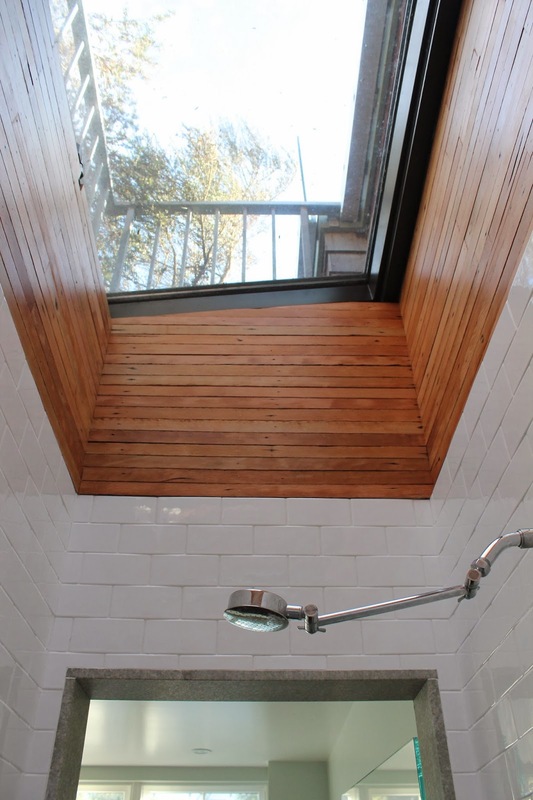 I think going horizontal with the lath was the right choice and I also hope that because the lath is planed it won't look cliche in a few years when that whole unfinished lath thing is inevitably completely dated. I love it. It looks like it's meant to be there now and way more modern! I totally don't get the unfinished wood indoors look either. I can't help but think of all the dirt that would get trapped (and how it would take more than a monthly/quarterly/annual scrubbing)...smart choice with the poly coating! i was skeptical! i will admit! but it looks gorgeous!!! i loved your comment on my blog– interesting advice! it's funny, we had already planned to live on the east side of the city because of better weather.... but then we starting expanding our search to include the richmond and sunset. it's easy to ignore the fog factor in the winter, and especially with the long stretch of perfect weather. the housing market is so tough right now. we'd like to buy a fixer upper and renovate to our own taste but decent listings are few and far between. where do you live? Oh! Thanks Caitlin- Google does that and it drives me nuts. Just an FYI that I never got this reply- I just found it while looking at this post again- not sure if its your site or if its me! 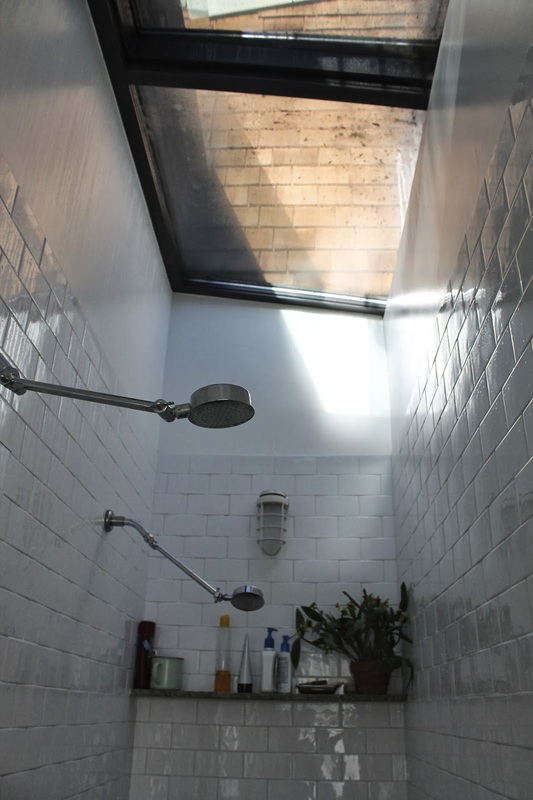 Holy glamoly, that is one amazing shower! I may have just sworn when I saw that. It went something like this: "Oh my god...look at that f-ing shower".